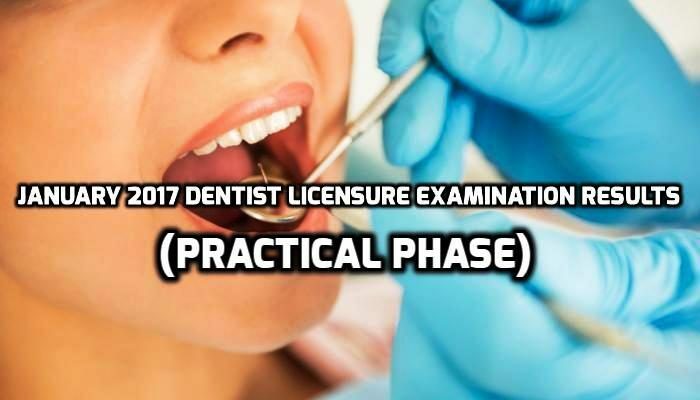 From the recently concluded December 2017 Dentist Licensure Examination held last January 3, 2018 for the Written and Practical Phase, the Professional Regulation Commission (PRC) already revealed the names of successful board exam passers. According to the commission, 1484 took the Written Phase and about 762 passed the examination. As for the Practical Phase, 769 took the board examination and 763 passed. 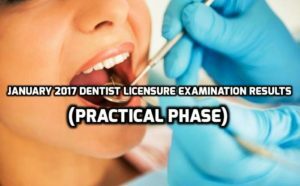 The Board of Dentistry administered the scheduled licensure exam held in Manila this month. As detailed through the official website of PRC online, the registration of the passers for the issuance of Professional Identification Card (IDs) as well as Cerfiticate of Registration will start from January 16-19, 2018 and all passers must complete the process online. From the latest shared information through the official website of Professional Regulation Commission (PRC), it recently announced the list of those who pass the September 2017 Dentist Special Professional Licensure Board Exam held in the Middle East on September 1, 2017. This board examination is for the written phase and according to the PRC, 17 applicants to the exam and only 3 of them passed. The testing centers include Abu Dhabi (UAE), Kuwait and Al-Khobar, Jeddah and Riyadh (KSA). The Board of Dentistry’s OIC Dr. Roberto M. Tajonera and the assigned members administered the examination last month. The commission was able to release the names of passers on October 19, 2017.